Going up against a Star Destroyer in a snub fighter, what’s not to like about X Wing? I still remember the first time I bought X wing. I was in high school at the time. I spent $40 at the time, was so excited by the idea, couldn’t wait to get it home and hop in the cockpit of my very own spaceship. Of course, I didn’t know much about computers and discovered I’d bought a mac version of the software, which I couldn’t then exchange (store wouldn’t allow exchanges of computer software). Money wasted, in a lot of ways. But the dream lived on, and when I saved up, I got a version of Tie Fighter that worked, complete with a joystick and I settled down to play. Even at the time, I knew it wasn’t a very good simulation for actual space combat. Ships moved at WWII aircraft speeds (sometimes WWI), the graphics were great for their time (but very dated now), the physics were completely inaccurate, and the overall gameplay was relatively simple and linear compared to modern games. What the game did do, however, was tell a great story, give challenging scenarios that required skills, thought, and even tactics. This further evolved with the follow on game a few years later with X Wing Alliance, which updated the graphics and allowed the player to play through a fun campaign, as well as evolving the multiplayer a bit more and allow crafting of scenarios. What did I get from these games? Well, they let you live out some of the most exciting aspects of the Star Wars universe, putting yourself in the pilot of a tiny ship and pitting your skills against not only the computer, but other people. They were tremendously fun, but they also were a key aspect of inspiration to me. They opened up a section of the Star Wars universe that was, until then, sort of vague and abstract. You could not only see what it was like to be in a military unit in this universe, but you could see how the flight mechanics, technology, and tactics could unfold. You could witness the awesome firepower of a Star Destroyer and also work together as a team to take one down using outdated snub fighters and hot-shot piloting. I still maintain that a lot of modern games lack that same spark. Games like Mass Effect and Eve Online are RPGs, where it is the skill of the character rather than the player that determines an outcome. This is fine, in many ways, but it also somewhat distances the player from his accomplishments. With an RPG, you can ‘build’ a character to accomplish tasks. While you might take some pride in taking down a ship or discovering some new planet, you aren’t the one doing it… your character is. At most, you have skill in using the character’s abilities… which isn’t the same thing at all. 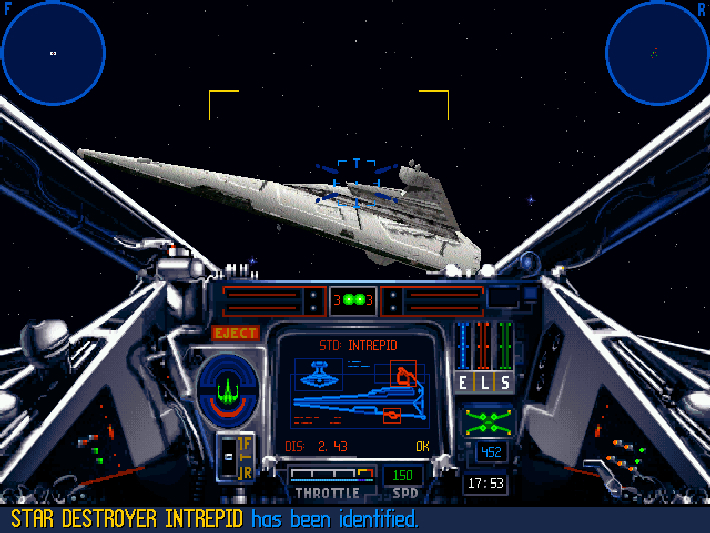 With simulator games like X Wing and it’s follow-ons, the player has a direct connection to their accomplishments. I think that brings a whole new level of excitement to the game. In many ways, getting into space behind a joystick is the pinnacle of my dreams… and doing so as me versus a character is far better. Other games, like Freelancer also explored and expanded on the groundwork, adding more options, entire worlds, star systems, and other mythologies as well as a bit more accuracy in physics and technology. They still have a WWII fighter feel, but they have entire star systems to explore and discover, with options to trade, explore, defend, and pirate. These games, in many ways, allowed their player base to live out their dreams of reaching the stars, if only in a limited sense, in a way that RPGs can’t do, in a physical, exciting fashion that brings the risks and rewards of space to the player. I’ll gladly admit that those old space simulation games inspired me with ideas and possibilities, and in many ways were responsible for keeping my excitement over space travel alive. I know for a fact that I wouldn’t be where I am now if not for the excitement that these games gave me in my youth. Unfortunately, these types of games became less and less common in the last decade, with most of the focus going to First Person Shooter games, sports games, or RPGs/MMORPGs. Space fighter simulations basically vanished, especially as big developers, like EA, consolidated a lot of the gaming companies and set about producing incrementally improved games based off their big sellers. Check back soon for my next post: Computer Games: Modern Space Simulations.